The typical ugly sweater is born at Walmart, embellished by Michaels, and then stored in the circular filing cabinet shortly after the year’s festivities have come and gone. 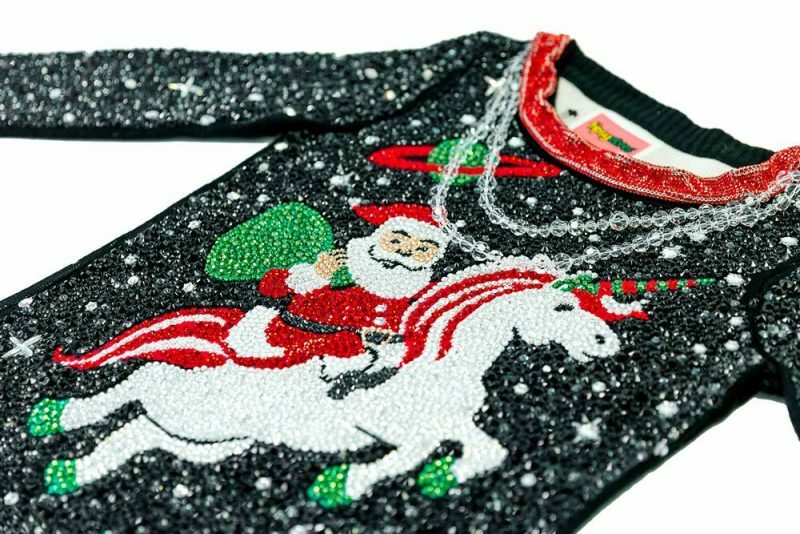 The ugly sweater above featuring Santa Claus riding a unicorn, gayly, is one that we’d consider quite deliciously atrocious, considering it consists of 24,274 Swarovski crystals. But not just that: each of the crystals has been meticulously attached by a master designer, taking no less than 52 hours to create. So this ugly sweater became somewhat more beautiful once we learned of all the quality materials and craftsmanship that went into its creation. But with a price tag of no less than $30,000, it is hard to believe it has already sold out on Tipsyelves.com, but it has (go ahead and click anyway, as there are more photos to ponder in amazement).